Diana Hall, a physics teacher from Bell High School, Ottawa, Canada is spending 6 months in Tanzania helping build a more active science program. This reminds me of my time in Nigeria (while my father taught Chemical Engineering at the University of Ile Ife to help build a strong university program). It is great to see all the good that people are willing to do. The objective of the Do Science, Tanzania project is to share teaching strategies and equipment with science teachers and students in Moshi, Tanzania. The goal is to facilitate a more active science program and to inspire students to continue studying beyond the secondary level. 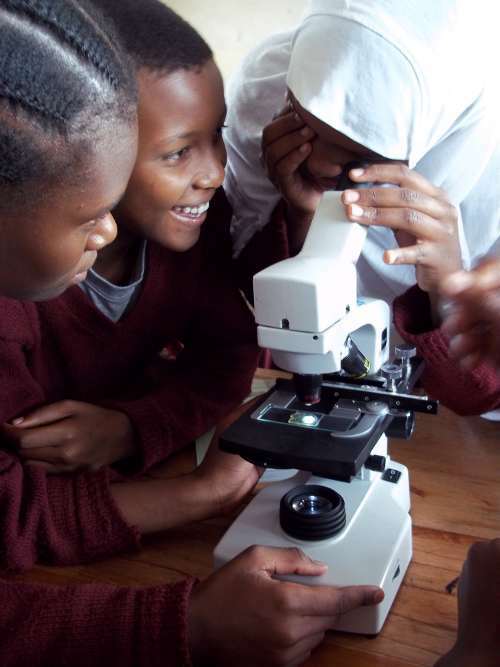 The photo shows students at Reginald Mengi Secondary school, Tanzania, getting their first experience with microscopes in the classroom. There are over 210 Form I (freshman in high school, for you USA readiers) students in 4 classes. The 4 classes had an introduction to the microscope by preparing slides and viewing onion cells. Working with science teachers is a big part of do Do Science is about. Their blog discusses a recent meeting where 50 science teachers from the Moshi area attended a workshop. The teachers at the workshop modeled thinking exercises, conducted sample labs, investigated computer simulations and interfacing equipment, looked at some DVD resources. and networked. You can help by donating equipment or money. Or if you are a science teacher with workshop and leadership experience who would consider spending some time in Tanzania as a facilitator? We are seeking videos that are creative, surprising, and “contagious” in terms of spreading your enthusiasm about science to others. Videos might explore a scientific concept, show us the wonders of nature, give us a glimpse into the future, show us what scientific discovery has done for us in the past or will do for us in the future, introduce us to a great scientist or engineer, tell us why you think science is so cool or simply show us why we should care about science and/or engineering. 1st prize: $1,000 (to the school or science club); plus $500 electronics gift certificate for the student (or student group); plus a travel stipend to travel to Washington DC for the Expo! In addition, the winning videos will be screened during the USA Science & Engineering Festival Expo on the National Mall in Washington DC on October 23 and 24, 2010 and at other key Festival events. Find out how to submit a video. The format of the tinkering school is week long sessions where the kids stay overnight. Gever Tulley recently published: Fifty Dangerous Things (You Should Let Your Children Do). The Infinity Project is a national middle school, high school, and early college engineering curricula. The math and science-based engineering and technology education initiative helps educators deliver a maximum of engineering exposure with a minimum of training, expense and time. Created to help students see the real value of math and science and its varied applications to high tech engineering – The Infinity Project is working with schools all across the country to bring the best of engineering to their students. The Infinity Project curriculum is a complete, year-long course designed to complement the existing mix of math and science classes. Experience in classrooms all across the United States shows that Infinity keeps students challenged, learning and exploring from start to finish. Using The Infinity Project curriculum in the classroom, students learn firsthand how to use math and science to create and design a wide variety of new and exciting technologies that focus on topics of interest to students – the Internet and cell phones, digital video and movie special effects, and electronic music. Engineering Our Digital Future is designed for early college students or high school students who have completed Algebra II and at least one science course. The course focuses on the fundamentals of modern engineering and technology in the information and communications age. We are here today to honor teachers and mentors like Barb who are upholding their responsibility not just to the young people who they teach but to our country by inspiring and educating a new generation in math and science. But we’re also here because this responsibility can’t be theirs alone. All of us have a role to play in building an education system that is worthy of our children and ready to help us seize the opportunities and meet the challenges of the 21st century. Whether it’s improving our health or harnessing clean energy, protecting our security or succeeding in the global economy, our future depends on reaffirming America’s role as the world’s engine of scientific discovery and technological innovation. And that leadership tomorrow depends on how we educate our students today, especially in math, science, technology, and engineering. But despite the importance of education in these subjects, we have to admit we are right now being outpaced by our competitors. One assessment shows American 15-year-olds now ranked 21st in science and 25th in math when compared to their peers around the world. Think about that — 21st and 25th. That’s not acceptable. And year after year the gap between the number of teachers we have and the number of teachers we need in these areas is widening. The shortfall is projected to climb past a quarter of a million teachers in the next five years — and that gap is most pronounced in predominately poor and minority schools. And meanwhile, other nations are stepping up — a fact that was plain to see when I visited Asia at the end of last year. The President of South Korea and I were having lunch, and I asked him, what’s the biggest education challenge that you have? He told me his biggest challenge in education wasn’t budget holes, it wasn’t crumbling schools — it was that the parents were too demanding. (Laughter.) He’s had to import thousands of foreign teachers because parents insisted on English language training in elementary school. The mayor of Shanghai, China — a city of over 20 million people — told me that even in such a large city, they had no problem recruiting teachers in whatever subject, but particularly math and science, because teaching is revered and the pay scales are comparable to professions like doctors. 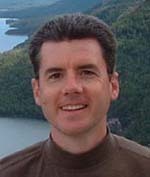 Dr. George E.P. Box wrote a great paper on Teaching Engineers Experimental Design With a Paper Helicopter that can be used to learn principles of experimental design, including – conditions for validity of experimentation, randomization, blocking, the use of factorial and fractional factorial designs and the management of experimentation. For our statistics class, we have been working hard on a Design of Experiments project that optimizes a paper helicopter with respect to hang time an accuracy of a decent down a stairwell. We were to design a helicopter that would drop 3 stories down within the 2ft gap between flights of stairs. [design of experiments is] very powerful when you have lots of variables (ie. paper type, helicopter blade length, blade width, body height, body width, paperclip weights, etc) and not a lot of time to vary each one individually. If we were to individually change each variable one at a time, we would have made over 256 different helicopters. Instead we built 16, tested them, and got a feel for which variables were most important. We then focused on these important variables for design improvement through further testing and optimization.